Professor Yasmin Haskell is a Chief Investigator, ARC Centre of Excellence for the History of Emotions: Europe 1100-1800, at University of Western Australia. Her research project on Jesuit emotions explores the theory, experience and performance of emotion in the Early Modern Society of Jesus, the most influential order of educators in Catholic Europe and its colonies until the end of the eighteenth century. Her project on ‘passions for learning’ opens up the emotional worlds of scholars, scientists, teachers, and students from the Middle Ages through to the nineteenth century. Here she reflects on an alternative possible inspiration for the new Pope’s choice of name. Jorge Mario Bergoglio has chosen the papal name ‘Francis’, which will suggest to most Catholics the founder of the Franciscan order, Francis of Assisi. Pope Francis’ gentle and unassuming style, his poverty – if catching the bus and cooking one’s own meals really qualifies as poverty in the Latin American context … – point to the medieval Italian saint who preached to the common people, and legendarily, to the birds. 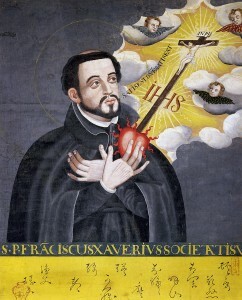 But Francis was also half the name of one of the Jesuits’ earliest saints, Francis-Xavier (1506-1552), the fervent and restless ‘Apostle to the Indes’, who took Catholic Christianity to India, Japan, and the East Indes in the early modern period, dying of a fever just fourteen kilometres from the shore of mainland China. Perhaps Pope Francis quietly gestures to this sixteenth-century Jesuit missionary, too, who has come to represent the global reach of the Catholic Church, and embodies the evangelical zeal for ‘harvesting souls’ which fired so many members of his order in the early modern period. So who were the Jesuits? The Society or Company of Jesus was a Catholic Reformation order founded in 1540 by Basque nobleman and former soldier, Ignatius of Loyola, and a bunch of his student friends (among them Francis-Xavier). They quickly earned a formidable and paradoxical reputation. The Pope’s crack troops were deployed from Messina to Macao, Paris to Paraguay, recruiting converts, fighting the spread of Protestantism, and educating the élites of Catholic Europe and her New World colonies. They conducted diplomatic business and scientific research, composed music and poetry, and shocked and awed audiences with theatre and pyrotechnics, art and architecture. Jesuits were prepared to die for their beliefs in faraway missions, but they were also accused of being slippery and self-serving. They championed native Indian rights, but enslaved Africans. In their ranks were to be found hard-nosed heretic hunters, as well as defenders of the rights of ‘witches’, and believers in magic. Renowned for their chameleon-like ability to adapt to local circumstances – dressing as mandarins in China or brahmins in India – the proud and powerful ‘black robes’ couldn’t help but stand out even on Catholic home turf. Victims of their own success, the Jesuits were hounded out of France, Spain, Portugal, and the New World. The ‘Old’ Society of Jesus was shut down by the Pope in 1773. The Society of Jesus was restored in 1814 and has regrown to become the single largest order of the Catholic Church. The ‘New’ Society has had its share of arch-conservatives, Nazi-resisters, freedom-fighters, and most recently, liberation theologians. It retains its former reputation for education and intellectual sophistication, and the twentieth-century names of Pierre Teilhard de Chardin (philosopher, mathematician, palaeontologist, and evolutionary biologist) and Frederick Copleston (philosopher and historian of philosophy) would not look out of place among the great biographical dictionaries of pre-modern Jesuit careers (e.g. Carlos Sommervogel’s Bibliothèque de la Compagnie de Jésus). But the heart has always been just as important as the head in Jesuit theology, and much of the Society’s thinking, historically, has gone into questions of how to rouse, channel and discipline the emotions. This entry was posted in Emotional Currents and tagged Jesuits, Pope Francis, religion, Saint Francis-Xavier by Yasmin Haskell. Bookmark the permalink.